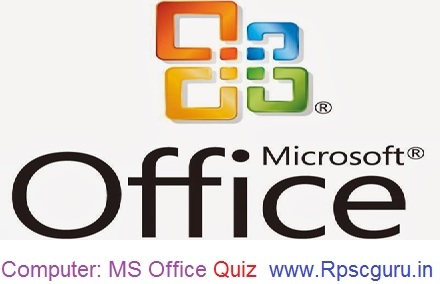 It was long time gone when we uploaded the Computer Awareness Quiz on your RpscGuru website . Well, many of you were kept on asking for more Quiz/ Questions and important study materials for Bank and SSC exams. We promised you that we will definitely consider your request for future and update Quiz, Question-Answer regularly. Well, the revolution is quite rare in Education field and in this era, monotonous things won't be that much efficient. So we have decided to come back with a whole new concept and whole new form. Yes, We are presenting "THE COMPUTER AWARNESS QUIZ". This particular show, will deal with needs and requirements of Microsoft Office Quiz. Now a days almost competitive exams computer knowledge is required is mostly and Computer Knowledge used mostly in bank, SSC, UPSC and mostly state level examinations. Following are some important Computer Awareness Quiz/ Questions which are likely to asked or already asked in mostly competitions exams. Following Computer Quiz will help you securing good marks in upcoming IBPS PO, SBI PO, IBPS Clerk and other competitive exams. 1. Which of the following is not valid version of MS Office? 4. What is the short cut key to open the Open dialog box? 6. Where can you find the horizontal split bar on MS Word screen? 7. Which of the following is not available on the Ruler of MS Word screen? 8. What is place to the left of horizontal scroll bar? 9. Which file starts MS Word? 10. How many ways you can save a document? 11. If you want to keep track of different editions of a document which features will you use? 13. What is a portion of a document in which you set certain page formatting options? 15. Which of the following is not a type of page margin? 16. What is the default left margin in Word 2003 document? 17. What is gutter margin? 19. If you need to change the typeface of a document, which menu will you choose? 20. Which of the following is not a font style?